For many millions of individuals across the country, mobility vehicles, like the electric wheelchair, provide a safe and reliable means of getting around. These devices can allow people to go virtually anywhere, but it is important to have a way to transport the mobility vehicle. Some people that know they will need to transport their mobility vehicle opt to go with a portable wheelchair or travel scooter. These devices are designed to be lightweight, can be taken apart easily, and only take up a little bit of space, so they can usually be lifted into the trunk of a car or even the backseat. While these devices are easily transported, they lack many of the features that a full sized scooter or wheelchair would offer. They also are less durable, support less weight, and have a shorter range. They can be a great choice if you will only need to use the scooter occasionally, but for everyday use they are not as practical. As a result, most people who use their mobility vehicle on a regular basis opt to go with a full sized model. Transporting a full sized scooter or electric wheelchair is a little more difficult, but with a wheelchair lift installed, this task is greatly simplified. A wheelchair lift is designed to make it possible to transport a mobility vehicle in an automobile. One of the most popular kinds is the external wheelchair lift. An external wheelchair lift can be installed in only a few minutes to the hitch of an automobile. They simply slide into the hitch and are secured in place with a hitch pin. They are then either plugged into the cars battery, or a rechargeable battery pack, and are ready to go. The big advantage of an external wheelchair lift is the ease at which they can be installed or removed, and the fact that vehicle modification is not typically required . However, since the scooter or wheelchair will be stored outside of the automobile, it will be exposed to weather and other elements. Internal wheelchair lifts solve this problem. 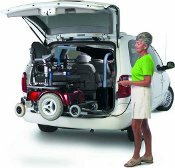 An internal wheelchair lift is designed to store a scooter or wheelchair inside of the automobile. For smaller automobiles, like cars, a crane lift is generally used. The crane lift has a telescoping swivel arm and can be installed into the trunk of a car. A harness is attached to the scooter or wheelchair and it is then hoisted into the automobile. Some models offer powered rotation, in which the swivel arm can be moved horizontally with only the push of a button. These are often used in places where a larger wheelchair lift would not work. The other type of internal wheelchair lift uses a platform lifting system that is very similar to an external hitch mounted wheelchair lift. The major difference is that the platform extends from inside of the automobile and retracts to store the wheelchair or scooter internally. These types of lifts are a great choice, because they keep the vehicle protected from external elements. When they are used in the middle compartment of a van, they can allow for the drive to easily exit from the vehicle to their wheelchair. However, they do take up space inside of the vehicle and require a more permanent installation. People who are mobility challenged often turn to wheelchair lifts to increase their ability to get around.